Ketchikan, AK - The Alaska Marine Highway System (AMHS) welcomed the newest member of its fleet, the M/V Lituya, in Ketchikan Satuday afternoon. The $9.5 million vessel, built by Conrad Shipyards in Morgan City, Louisiana, will provide daily ferry shuttle service between Metlakatla and Ketchikan. 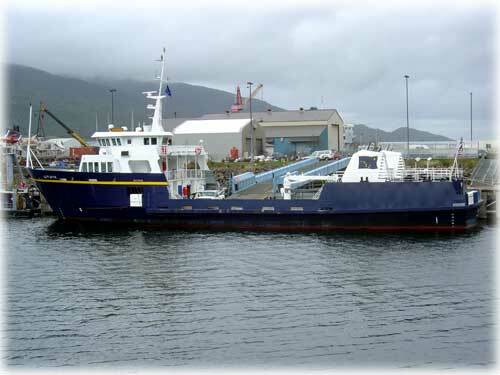 Lituya was designed by Coastwide Engineering of Juneau in 2001. With a delivery crew of six, the Lituya completed a 6,035-mile journey from Morgan City to Ketchikan. The ship can transport up to 18 vehicles on its open car deck and accommodates 149 passengers. The Lituya is the marine highway's first "T" boat and will homeport in Metlakatla. With the arrival of the fast vehicle ferry Fairweather, the AMHS now counts 10 ships in its fleet. "The marine highway is particularly pleased with this welcome addition to the fleet," stated Senior Port Captain Lynn Melin. "M/V Lituya will provide a significant improvement in service to the Metlakatla community at reduced operating cost," she added. With an average fuel consumption of 60 gallons per hour at service speed, the Lituya will be the most economical vessel in Alaska's marine highway system. Some major characteristics of the ship include a 50-foot beam, 10-foot draft and service speed of 12 knots. It has two 1,000 horsepower diesel main engines driving twin screws through reduction gears and clutches. Lituya also has a ship's service diesel generator and a back-up ship service and bow thrust generator. The vessel's three rudders provide additional responsiveness in close maneuvering situations. According to the Alaska Department of Transportation, following completion of final inspections and crew orientation training in Ketchikan and Metlakatla, the State anticipates formal acceptance of the Lituya later this month. An inaugural ceremony in Metlakatla is scheduled for May 4 and will be attended by Lieutenant Governor Loren Leman and Lituya's sponsor, Mrs. Carolyn Leman.